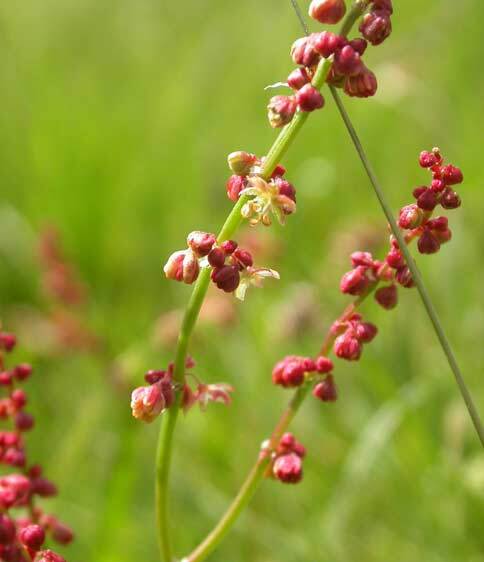 Sheep sorrel, Rumex acetosella, is another weed that caught me off guard. It was growing prolifically under my apple trees, but it was so easy to pull that I thought it was actually kind of fun to rip it out. I have since learned that the little plants are like pawns in a chess game. There are a lot of them sent out ahead, dispensable for the sake of protecting the queen…in this case the main plant. 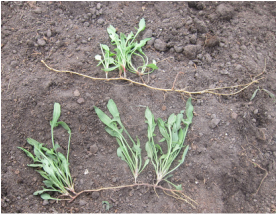 One source described its spreading rhizome — the underground stem — as “aggressive.” If you carefully pull a little plant in soft, moist soil you can see this aggressive rhizome with a string of little plants like beads on a necklace. Sheep sorrel is, not surprisingly, a member of the sorrel family. It is also known as sheep's sorrel, red sorrel, sour weed, and field sorrel. The term, “Sorrel” comes from the Old French surele, which came from the Germanic sur which meant, “sour.” The “red” description coms from its red tinted stems and reddish-maroon flowers. Like other sorrels, sheep sorrel contains oxalates. Many foods contain oxalic acid and it is fine in moderate amounts. A balanced diet and plenty of liquids flushes out excess oxalic acid. It is just when foods high in oxalic acid are consumed in large amounts that it becomes an issue. Straight oxalic acid is used commercially to remove rust from car radiators and antifreeze (ethylene glycol) is toxic primarily because it is converted to oxalate. 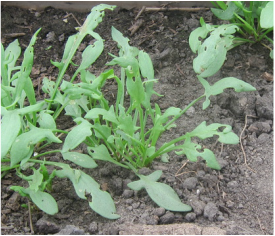 If you are really into the eating-weeds-thing, there is nothing wrong with including sheep sorrel in your diet. Sheep sorrel can be substituted for garden sorrel in any recipe and may even be more tender. Like most of the plants in the sorrel family, the leaves have a lemony, tangy, tart flavor and it contains vitamin C and A, some calcium and potassium. It can be used to add a tart lemon flavor to salads, as a garnish or to curdle milk when making cheese. It's just wise not to over do your consumption of it and if you have problems with kidney stones you should not sorrel or anything high in oxalic acid at all. On the plus side, because of its high vitamin C content, sorrel has been used to prevent scurvy and the Sloan-Kettering Cancer Center reported that sheep sorrel increases muscular activity and fluid secretion in the intestines, preventing constipation. The American Copper butterfly caterpillar depends on it and other members of the buckwheat family such as the dock weeds, rhubarb and garden sorrel for food. Except for the rhubarb, this is one caterpillar I would like to see eating more plants in my yard.